Is this a pet peeve…? Lets just get this massacre started. “LOL”… I am guilty of overusing this phrase. I “laugh out loud” way to much. I just feel like people should know my emotions when we are texting. “L8R”… what to say about this phrase. I never used this one and I’m unsure if people are still using it. Somewhere down the road someone got confused… But do not worry! I am here to clarify: letters are used for spelling words and numbers are used to count! just saying…. “JK”- I am guilty of using this, but not as much as “lol”. “JK” is really a cover up for something that you want to say but is not socially acceptable. Its like how in the south if you precede a statement with “bless his heart” you can say anything you want about a person. “k”- I believe that this little abbreviation shows just how lazy we are. The original word is “okay”, but we shorten it to “ok”, but NO that’s still too long thus the single letter “k”. I cannot claim the witty intelligence that came up with the next statement but it makes me smile so I had to share it with you =) “K? K what? K the letter before L,the letter after J? Did you know that in JK, K stands for “Kidding”. So your reply is “Kidding?” Or K as in Potassium? Do you need some Special K breakfast? K, as in I can K/O you? Can I knock you out and feed you to hungry sharks? Sharks has a K in it.” Nuff said! The next two, “rofl” and “lmao”, I will lump together. Maybe I should have done one giant number on laughing techniques, any who… rolling on the floor laughing. When I see this I just want to respond “ARE YOU!?! Man I must be really funny to make you want to ‘roll on the floor’ maybe I should be a comedian.” Then there is the other one which I will not spell because my grandparents read my blog, hi <3. I will just say that if you ever laugh so hard that body parts start to fall off you should probably seek medical attention… just saying. With that being said (just saying) let me introduce you to my favorite abbreviation! “js”= just saying. I don’t think anyone actually uses this besides me, I could be wrong, but my friend B’Mer started saying it and it’s just so catchy… I know I’m a hypocrite. All of the previous entries have been fairly old abbreviations. The next three are newer on the lingo scene. First we have “smh”. I had NO IDEA what this meant! It was extremely frustrating to see everyone saying smh all the time. (right now you should be envisioning me pulling at my hair saying “what does that mean” hey that could be a new abbreviation… wdtm js) Just so you know it means “shaking my head” Like I need to see you disapproving? Last but not least we have “YOLO” this has been making its debut on social media. I will not digress on this blog about how so many people, regardless of age, are putting UNESSICARY AND INAPPROPRIATE things all over the web. “YOLO” stands for “you only live once”. This statement may be true, but I think people are getting the wrong idea. Since we only live once we should respect ourselves and live a good, meaningful life. 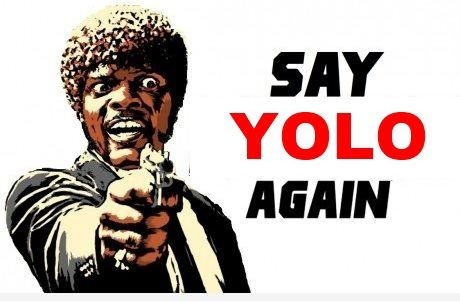 Instead you see all these crazy people doing DUMB stuff and slapping YOLO on the picture. I mean come on, this is like another excuse phrase “I know I shouldn’t be doing this but if I say YOLO everything is magically ok”… uh no, it’s not. People shouldn’t be out there trying to catch “diseases” like their Ash on Pokémon (gotta catch ‘em all!… ew) YOLO so please take care of these things:your heart, your body, and your mind… you can’t get these things back in the same condition you gave them in. This entry was posted in my thoughts and tagged acronym, brb, ily, jk, js, k, l8r, lmao, lol, peeve, Pet, rofl, smh, tbh, yolo. Bookmark the permalink. The “K” spill. lol. Kills me everytime.